The super financial basic that we won’t miss anymore. Learn the super financial basic from 4 different sectors at once: Banking, Stocks, Crypto, and Forex. Start your 2019 with Financial Hacks from the experts! 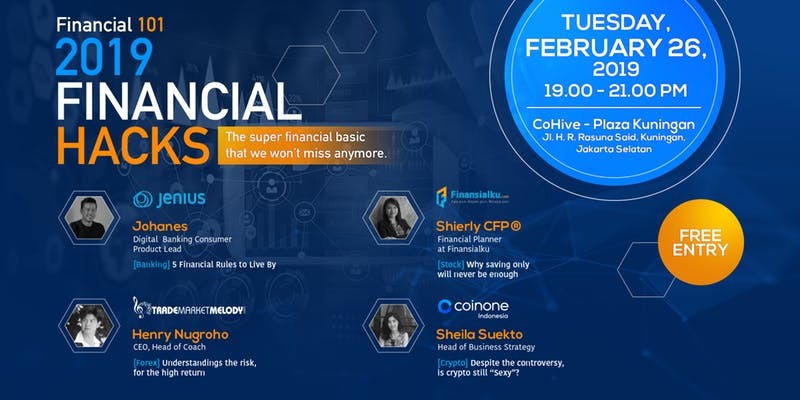 This collaboration event is brought by: Jenius, Finansialku, Coinone Indonesia, and Trade Market Melody Trading School. This is a FREE event. Don’t miss it. Register now as seat is limited.